This historic district in the southeast corner of the old Town of Oak Creek became a center for various industries which would have been offensive and noxious in a more populated area. The first industrial development was the building of the Lakeside Distillery in 1892 by P. R. and John Francis Carroll. Five homes for workers, now demolished, were built next to the distillery which now houses a fertilizer plant. In 1898, the U. S. Glue Company was formed to manufacture glue from the by-products of Milwaukee’s tanneries. This company built fifty-two frame homes on High and Maple Streets for its employees. Other industries in the area included the American Tar Paper Products Company and the Newport Chemical Company. In 1955, the Carrollville area was incorporated into the City of Oak Creek, although a Carrollville post office existed until 1964. The Carl Schroetter Farmstead is the only example of Greek Revival style Cream City brick to be found in Milwaukee County. Although the one-time farmland has now been subdivided, the farmhouse built for and by Carl Schroetter in 1857 and the farm buildings on the remaining 1.25 acres, are in good shape. The house is brick, painted red with white trim, simple Greek Revival in style. Originally a two story rectangular block, it is now L-shaped and has an old summer kitchen in the wing. The farm buildings included a splendid brick silo, barn and a granary with a field-stone and brick foundation. The broken pediments, almost flush bargeboards, and horizontal upper window frames make the north wing a rare (for this area of the country) example of Greek Revival style. The north side of the building also features a metal tie for the crossbeams. The farm belonged to Carl Schroetter until 1868 when it was acquired by the Schmidt family until 1972. It is possible that Adam Schmidt was the first owner when the 1876 atlas was compiled. The atlas lists him as a farmer, native of Germany, who settled in this country in 1850. The south and west wings of the house are of slightly later construction and were probably added by Adam Schmidt. The barn also dates from the 1850s and huge pegged logs are the key supporting beams. The owners at time of landmark designation, Russ and Betty Tschohl, were the third family to own the property. They preserved its unique character. Joseph Meyer emigrated from Switzerland in 1836 and settled in Rochester , New York . He established the Meyer family farm in 1836 in the Town of Oak Creek . Six generations of Meyers have lived on the farm. The first Mr. Meyer built a house for his father-in-law about 1860. The farm was originally 144 acres and grew. It was originally a general type of farm, but the later Meyers gave up the animals. About 2000, the oldest of LeRoy and Beulah Meyer’s sons took over the property. At one time, the orchard covered nearly 35 acres, and the family grew apple, plum and cherry trees. Of that acreage, 15 acres contained cherry trees. The Meyers offered the public the opportunity to “pick their own” fruit. Eventually, the orchards were sold for apartment development. When I-94 was being developed, the Meyers sold about 20 acres of wooded land. Wehr Nature Center also dug up wild flowers for replanting in its prairie section of the Center. Pittsburg Paint also had a paint testing site along South 27th Street for many years. At the end of the 20th and beginning of the 21st century, the land was developed into commercial and residential properties. St. Matthew’s Roman Catholic Church is the oldest Catholic Church in Milwaukee County located outside the City of Milwaukee. The original log church built in 1841 was replaced by a Cream City brick structure completed between 1858 and 1861. The brick church served the St. Matthew’s congregation for a period of 100 years before being replaced by a new facility in 1961. Twenty years later, it was decided that the old church should be restored and used for family services and other special occasions. This restoration was completed by 1993 when it was re-dedicated. Over the course of its history, St. Matthew’s Catholic Church has served the Irish, German and Slovak ethnic communities of Oak Creek. The property was designated for its historic and cultural significance. The Oak Creek Historical Society was established in 1964 when a group of concerned citizens led by Henry Mahr joined forces to save the 1874 Oak Creek Town Hall which was slated for demolition in order to permit construction of a new city hall. The group succeeded in raising sufficient funds to move the historic building to land donated by Forest Hill Cemetery, and it now stands as the centerpiece of a five building complex dedicated to the preservation of Oak Creek’s history and heritage. 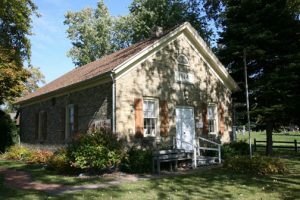 In addition to the Town Hall, the Oak Creek Historical Society Museum Complex also includes the 1840s Hughes log cabin, the 1886 Edgar Wohlust blacksmith shop, the 1890 Franke farm summer kitchen, and a farm shed. The property is honored for its historic significance.